They're far from full-length, but Trixie's whiskers are making a good comeback. When they were first gnawed off, the bristly stubs stuck straight out. Now that the've grown a little more, they're starting to curl downward like they should. I doubt they'll be back to their full glory by the time Trixie leaves our nest, but they are well on their way. Someone, on Facebook, I think, had asked about her lonely eyebrow whisker. From the start, she's always had just the one. Bean's eyebrows are asymmetrical too - she has five or so about her right eye and just a couple of them above the left. So you all can see the progress her whiskers are making, here are a few recent photos. To see the tiny nubs when they first went missing, please visit this post. They've come a long way, haven't they? I used to like to eat dry spaghetti- I see the allure. 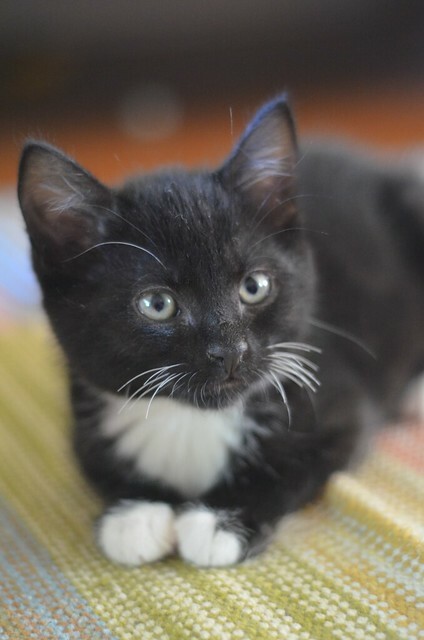 My tuxedo had a bout of short whiskers when he was a kitten. And he has just 1 white eyebrow although it's on the other side. Every once in a while, he loses the white eyebrow and his face looks completely different. She is so very cute. If I lived in your area, I would have swooped her up! 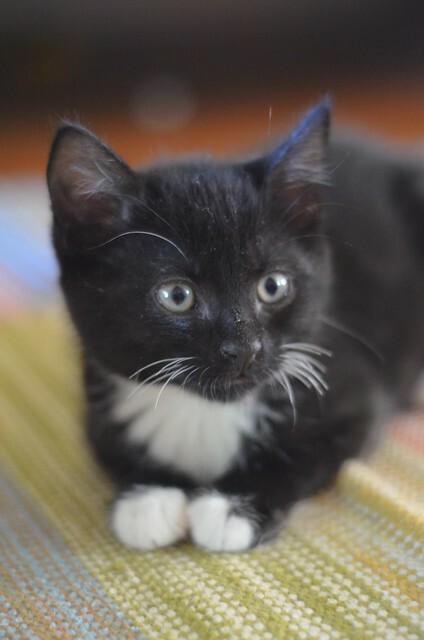 A 3rd tuxie in the family would have been fun. 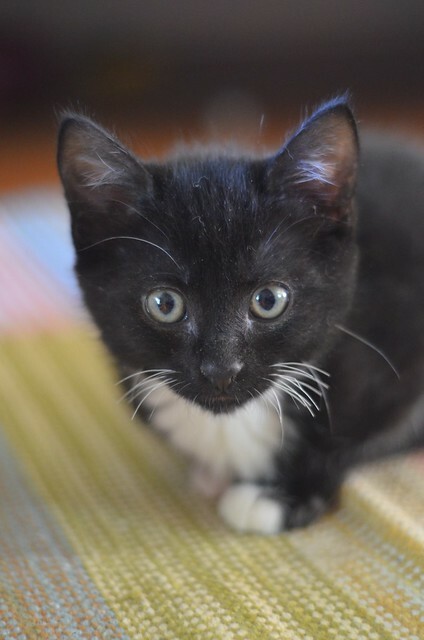 I know she will be in a loving home, with no whisker nibblers! Oh, my goodness sakes alive is she ever cute, did you say she was going with her siblings to one family? I am envious I have 3 but not like those itty bitty kitteh cats..but they are adorable and our family adores them..we got a little ginger cat that sits in my lap now when I do embroidery and the other older gal Miss Cody just doesn't get all upset, she knows she is still the once and reining Queen and our wild boy who is all black and cute as a button knows he is the tiny King of the house, all getting along..I love your ability to take such good care of all of the itty bitty kitteh cats and I love your Queen Charlene Butterbean and Miss Wylla Stout such regal kitty cats!!!!!!!!!!!!!!!!!!!!!!!!! Slow but sure, her whiskers are returning. Eventually, they will reach their full glory, but probably not in time for us to see it. 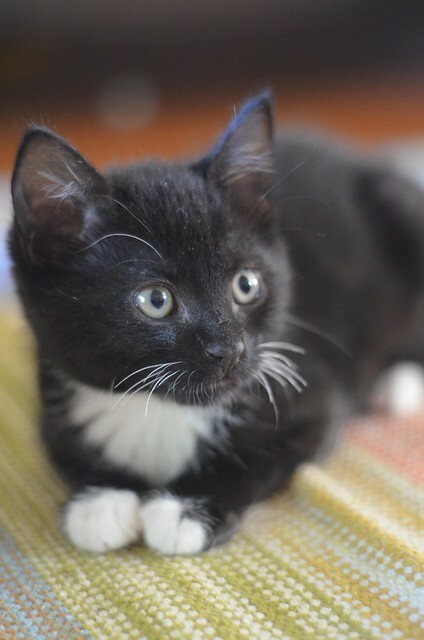 Maybe her furever home will share a picture. 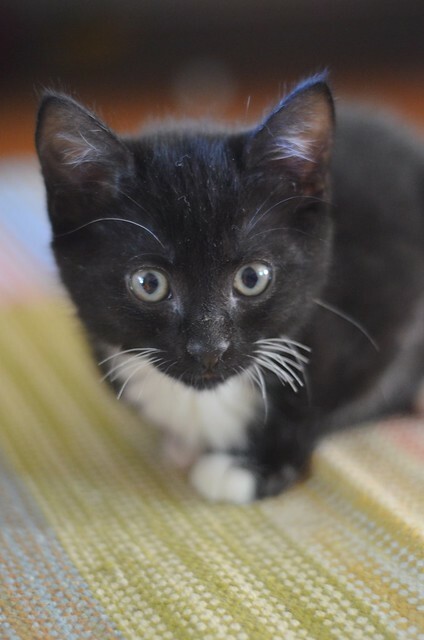 Awww, Trixie, sweet tuxedo kitten! Your whiskers have come a long way, as has all the rest of you! Perfectly cute, that's you!